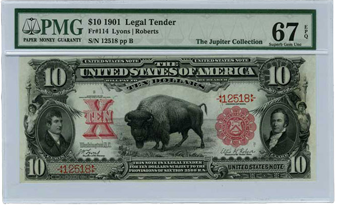 The bison vignette shown on the 1901 Legal Tender $10 note makes it one of the most popular US note types. The splendid design was so popular that it was re-used on a 30-cent postage stamp in 1923 and on a $1 Military Payment Certificate during the Vietnam War period. Although thematically this note design references the Wild West, the model for the facing view of the bison was actually a captive bison named “Pablo” who lived at the National Zoo in Washington, DC. This note was issued in nine signature combinations and is collected by Friedberg numbers 114 to 122. Although notes of this signature combination, Fr#114, are not the most common in all grades according to the PMG Population Report, it is the most available note in SGU 67 EPQ. That said there are only six certified at this level and none finer. 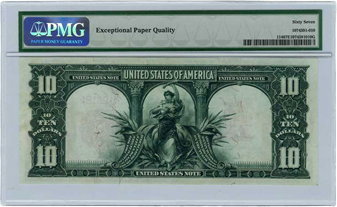 Additionally, PMG has never certified a Bison Note of any Friedberg number higher than SGU 67 EPQ. This beautiful example is from the Jupiter Collection and is so pedigreed on the PMG certification label.